We just love this back to school outfit that we designed at a customer's request. Perfect for the first day of school or any day during the late summer and fall. 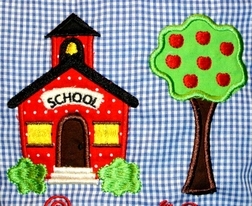 We start with royal blue gingham and style an aline swing top and applique it with a precious school house and apple tree for an apple a day for the teacher! 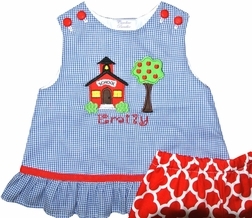 The top fastens with red buttons and is trimmed just above the ruffle with red scalloped ribbon. 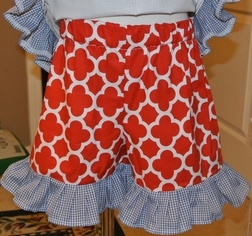 The shorts are made from gorgeous red quatrefoil fabric also finished with a royal blue gingham ruffle. 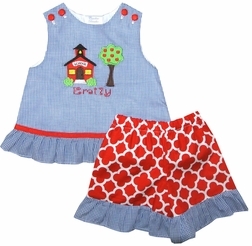 Under the school house, we monogram your little one's name in our new Swirly Girl font in red.